Region 7 KCACTF Winner Amy Beery won for "Sunday in the Park with George" and "Deus Ex Millennia." We jumped at the chance to be a sponsor again this year, as we believe it's important to empower and support young designers who are beginning their professional careers. "Year after year, the KCACTF Regional Awards produces impressive and inspiring projects," said Alice Lowy, marketing programs director at Vectorworks. "We jumped at the chance to be a sponsor again this year, as we believe it's important to empower and support young designers who are beginning their professional careers." Region 1: Liam Day from Clark University for "The Little Mermaid." Region 2: Christopher Erbe from Montclair State University for "Company." Region 3: Allison Granat from Valparaiso University for "His Dark Materials." 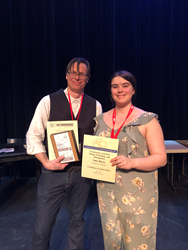 Region 4: Shelby Ashley from Northeast State Community College for "Crimes of the Heart" and "The Foreigner." Region 5: Mattie McIntosh from University of Nebraska-Lincoln for "Stupid F8cking Bird." Region 6: Eric Armstrong from The University of Arkansas for "Avenue Q." Region 7: Amy Beery from George Fox University for "Sunday in the Park with George" and "Deus Ex Millennia." Region 8: Christiana Kuey from Cal Poly Pomona for "Intimate Apparel." "Being awarded Vectorworks was a great privilege," said Ashley. "No one in my college has it, including the professors, so I am excited to teach myself and others how to use it. This will advance my skills in drafting and will help me continue my career as a designer."